It’s more than dust. The employee who works in a dusty environment is exposed to a deadlier form of dust, silica. 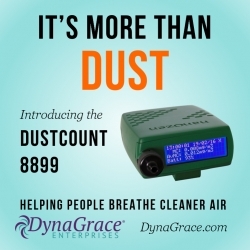 DynaGrace Enterprises, a WOSB and GSA Vendor, have been chosen to be a distributor of the Nanozen DustCount 8899, a real-time, wearable, respirable dust monitor. Instantaneous reporting makes compliance with OSHA Respirable Crystalline Silica standard easy. Salt Lake City, UT, February 25, 2019 --(PR.com)-- DynaGrace Enterprises today announced that they are expanding their product line to include state-of-the-art technology to monitor air quality. The Nanozen DustCount 8899, a real-time, wearable, respirable dust monitor detects air particulates down to a microscopic level in real-time. One way to do that is to have a worker wear the DustCount, for 8 hours and obtain the Total Weight Average (TWA). The rugged DustCount fits into a vest pocket or clips on a belt. The results can be analyzed real-time and downloaded at the end of the shift. The filter is then sent to an AIHA approved lab to be analyzed for silica levels. DynaGrace Enterprises accepted the opportunistic challenge from Nanozen because of their passion for Air Quality and the safety of the industrial worker. Products, like the Nanozen DustCount 8899, are making a difference. In 2017 OSHA reported 45,800 fewer nonfatal injury and illness cases compared to the 2016 statistics reported by the Survey of Occupational Injuries and Illnesses (SOII). The CDC age-adjusted statistics report that the death rate for Silicosis during the period of 2005-2014, went from 1.65 Male, .03 Female, per million in 2005 down to .69 Male, .01 Female in 2014. The statistics should only get better because of the new OSHA standard.